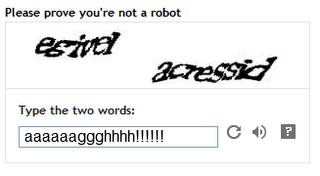 Random Thoughts: I Am Not A Robot! I would probably get this one correct, although it clearly frustrated the person who provided this image. This one is getting iffy. 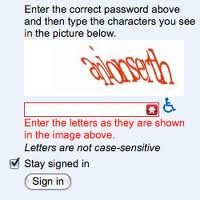 I probably would have entered "anlonserth" before noticing the third letter was actually an "i". Where is the second part of this? I see no letters or numbers in that photo. The number is clear here, but the letters? WTF?? The last two I took directly from a blog I was about to comment on. It often takes me two or three tries to get these ones correct. Who thinks up these things? A robot? Ha and I just got it wrong, too! Seriously, twice now.